The news is coming from German store MediaMarkt, which has reportedly teamed with Oculus for distribution in the past. 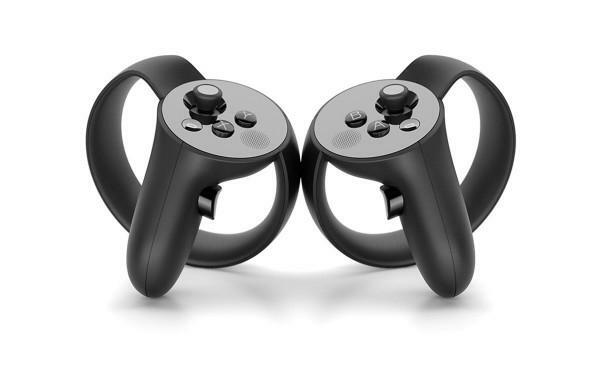 The retailer listed the Oculus Touch controllers on its website, priced at 199 which works out to around $230. Oculus hasn't confirmed pricing or the launch date on the Touch controllers, but we can expect more news from the Oculus Connect 3 conference which takes place October 5-7. Fro us with an Oculus Rift it's time to start saving money to buy some of this. From what I've read, these feel more natural than the HTC wands. I've used the Vive and it's amazing. If this is even equally capable, it will be a huge help for the Rift. $230 puts the total cost above HTC Vive, which is not good. Even if the controls feel more natural, the total platform support just plain isn't there. Compared to the 1000+ supported games in Steam VR and the availability of room-scale on Vive, it's going to be an interesting Holiday season as these things start showing up under Christmas Trees. True, price isn't good! I wonder if they'll have a bundle available upon release that would be priced closer to the Vive. The other problem I see is that you'll have many users without "Touch" controls, which means developers will likely feel inclined to make games that don't require Touch. If so, Touch owners ultimately lose. The same issue can be seen with Gear VR. Gamers with gamepads are getting overly simplified game controls, because most developers know that the majority of their potential buyers don't have gamepads, so controls need to be compatible with the touchpad. Yes, there are games that require a gamepad, but that automatically limits potential buyers. HTC did things right with the Vive. They always had the wands, so now developers can create content that utilizes them without worrying about excluding half of their potential customer base. I don't see Oculus' strategy here. They don't have the support, features or power of Vive and now they want to charge more for the full experience? If you're spending the money, why not go with Vive? I see no real compelling reason to choose the Rift. And if you don't want the full motion/room controls then why not spend half the amount and go with PSVR? As far as I can tell, Rift is now dead in the water. I also feel like the Rift should cut the price of everything, I don't know how is the thing to play any game with the Vive (I have the Rift) but my brother who is a gamer was strugling to play regular games, installing a lot of programs and some of those programs don't even gives any certain that the game will work as expected. Maybe with the Oculus Touch we will receive a set of games or something, otherwise I don't think I will get it at that price. That's a hefty price tag for controllers, Vive includes controllers but of course costs, more it's a trade off, now the more important question is who offers more bang for the buck? We are fortunate to have someone like you who is able to give us direct feedback on the Rift, there is so much hype out there that it's the best thing since sliced bread, and along comes Vive and now Rift is second best, at least that's the way it's starting to look. Whoa! $230 is expensive, but not too far out from what I was expecting. Back before the launch of the Oculus CV1 a lot of people were expecting they would go with a much lower price than they did - but the signs were all there, Facebook is positioning Oculus as a "premium" brand. Everything from the case to the build is designed to give the impression, if not the reality, of it being THE brand name VR device to have. That's right @EgoAnt, but being a pretty new market and having Steam (Vive) as competitor it's difficult to see how the things will work in the near future. For someone with a lot of money out related with VR maybe having all the options is what matters but for the users, paying less and having the same, or having access to more will define much of how the consumers will go. Right now the PSVR is the most "plug and play" and sold out in pre-orders for a lot of stores, I only hope they old get together and make all the VR content compatible which each other or maybe a company who make some interface or hardware to do that. Gee that's pretty expensive. Any definitive word if they're going to have 270-degree tracking? VR / AR in Hollywood Movies! How do you view screenshots in vr?